1895: Following the death of Major General Thomas Westropp McMahon in 1892, The Sycamores was sold to General Sir Reginald Ramsay Gipps KCB who was living in the house by 1895 according to the 1895 Kelly's Directory of Hampshire. General Gibbs's father was George Gibbs who was Governor of the colony of New South Wales, Australia, for eight years, between 1838 and 1846. 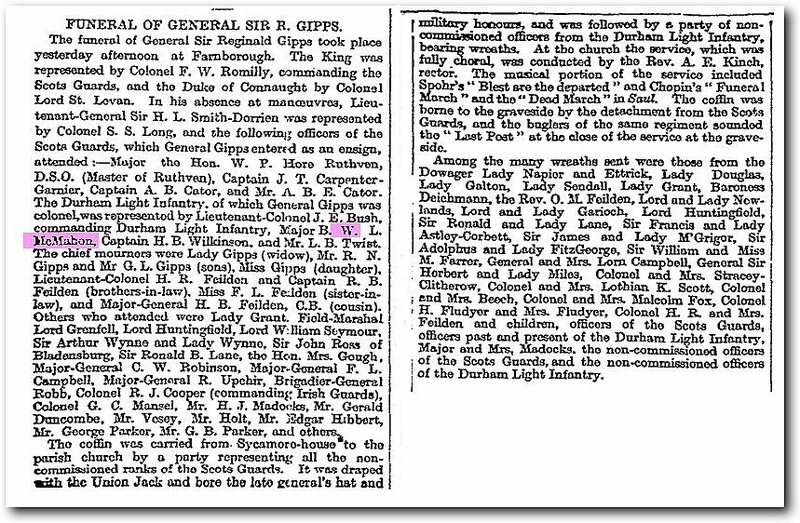 Reginald Gipps was gazetted ensign and Lieutenant in the Scots Fusilier Guards in April 1849 and served with them until 1881. On 20 September 1854 in the battle of Alma in the Crimean War he was wounded in the hand by a Russian bayonet at the Alma and on Nov 5th 1854 he was shot through the neck at Inkerman. He later participated in the siege of Sevasopol and remained there until the regiment returned in 1856, serving as adjutant from March to August 1855. 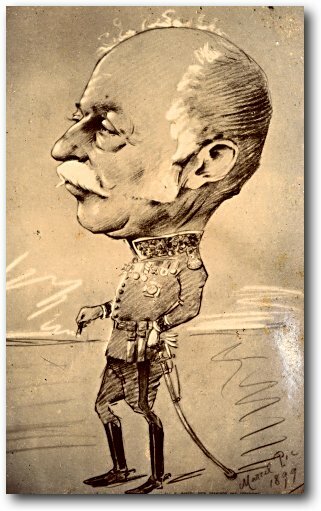 He was appointed Commanding officer in 1877 until 1881 when he was promoted to Major-General. He married Evelyn Fielden in 1886. 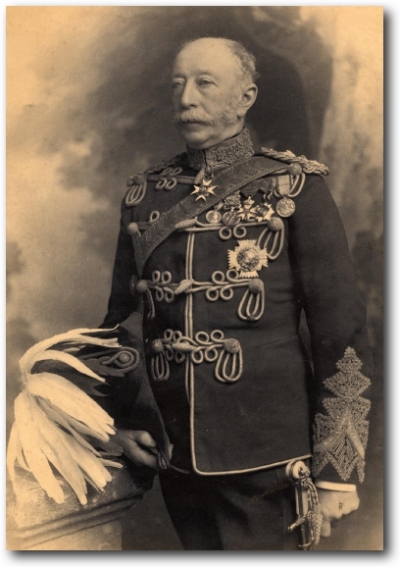 The photograph above [Credit: Durham County Record Office, Londonderry Estate Archives, D/DLI 2/1/291(5)] shows him in the uniform of Military Secretary to Horse Guards with the rank of Lieutenant-General, a post he held from March 1892 to May 1896. The role was to be the principal secretary to the Commander-in-Chief Of The Forces. Sir Reginald was promoted to General in May 1894, awarded the KCB and was Colonel of the Regiment of the Durham Light Infantry from Dec 1897 until September 1908 when he died. 1891: in the 1891 census Sir Reginald Gipps was listed as living in their London house at 11 Chester Street, Victoria with his wife and daughter both named Evelyn. 1896: Sir Reginald retired from all active duties in 1896 and the purchase of The Sycamores was clearly part of the retirement plan. He lived there for the last fourteen years of his life. According to the obituary in the Aldershot News, Sir Reginald did not really get involved in local Farnborough affairs during this time. 1897: A map of Farnborough Park dated 1897 shows that though not much has changed within the grounds of Sycamore House itself, several of the roads that now form Farnborough Park had been built although no other houses had been built by that time. 1901: Sycamore house [The Sycamores]: The 1901 census shows that the General and his wife were aboard at the time of the 1901 census and the only persons in residence were Thomas Fugle 66 and his wife Emma Fugle 67 who were acting as caretakers while the owners were away. Their children, including Reginald Nigel Gipps were being looked after at their London house at 11 Chester Street, London. 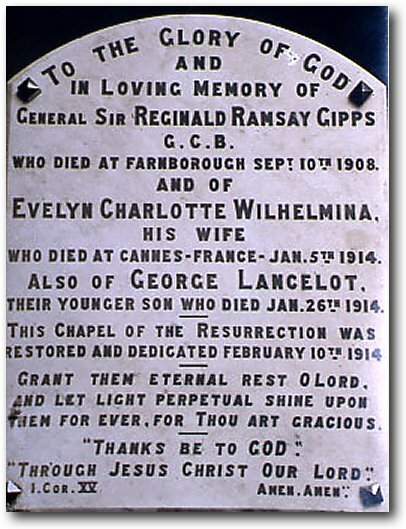 1908: General Sir Reginald Ramsay Gipps KCB died 1908 and the house passes to his wife Lady Evelyn Charlotte Wilhemina Gipps. 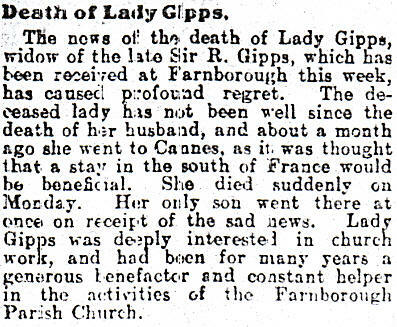 His obituary can be seen in The Times © dated Saturday, Sep 12, 1908 and the Aldershot News. 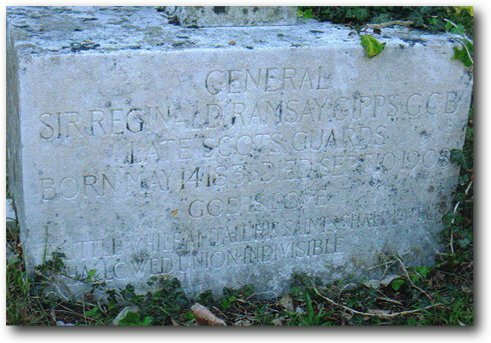 Sir Reginald Gipps's grave is located in the Victoria Road cemetery , Farnborough [Credit: Arthur Lunn, Cove]. 1908/9: Sir Reginald Gipps is still listed in the 1908 and 1909 London telephone directory - his son, Reginald Nigel Gipps also lives at this address. Her son mentioned above is Reginald Gipps as her only son, this is incorrect as her other son George did not die until later in month on the 26th January 1914. February 1914: In February 1914, the burial chapel in the Victoria Road cemetery was dedicated to become a memorial to former residents of Farnborough. A copy of Evelyn's will written in 1912 is held in the Hampshire Record Office (Probate copy will of Evelyn Charlotte Wilhemina Gipps, Sycamore House, Farnborough, widow of the late General Sir Reginald Ramsay Gipps, GCB - 43M79/F4). 1912: A 1912 map of Farnborough Park shows that by this time houses were now being built in Farnborough Park. It is worth noting that many of these were later demolished to make for many more smaller houses. June 1914: The Sycamores up for sale for the third time! 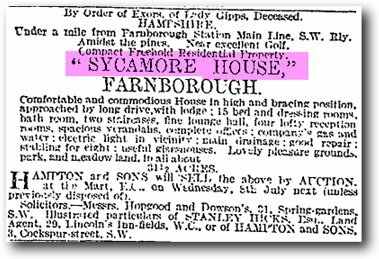 Sycamore house was advertised for sale in The Times ©, Saturday, Jun 06, 1914. 1915: Mrs Evelyn Romer, Sir Thomas's daughter, sold the house to Hillside convent in 1915.